If you are looking for a contractor in Edmonton for your commercial roof, you can not go wrong with Golden West Exteriors. We are committed to the quality of our work, and stand by it every time. Just ask one of our previous happy customers; we love finding new clients through word of mouth! Feel free to check out what other people are saying as well. As far as commercial roofing materials to go, we have many great options to choose from. Here, we would like to go over one of them: EPDM roofing. These are some of the benefits that you can reap when you take advantage of EPDM roofing installation in Edmonton. A major aspect of any roof is how much it weighs. The more a roof weighs, the more any structural movement will likely cause significant damage to your home. This is especially pertinent on soft, pliable soil that is liable to cause a home to move regularly. EPDM (ethylene propylene diene monomer rubber) roofing meets almost all weight limitations, regardless of the structure, because it is so lightweight. Not only is it lightweight, but it is also extremely flexible, which keeps it from breaking apart at the slightest movement from a building. Its light weight and flexibility, combined with its fully adhered attachment style, mean that EPDM roofing can be applied to any range and size of structure, as well as just about any geometric configuration, including high sloped buildings. Many residential roofing materials, like asphalt shingles, are susceptible to wind damage. Like most fully adhered roof systems, EPDM roofing has an extremely high wind uplift performance rating. This makes EPDM material the perfect choice for both tall building, and buildings in extremely windy areas. In a fully adhered roofing system, every single square foot of material is bonded to the insulation material of a roof, which minimizes as much as possible any membrane fluttering. While EPDM roofing isn’t necessary the pinnacle of architectural style, it does come with its own aesthetic benefits. For businesses that are in high traffic areas, and thus in the public eye, fully adhered systems can promote a tight, clean, and professional appearance. That is because they do not rely on fasteners or ballasts, which sit in plain view of everyone. Fully adhered roofing systems are completely hidden from view, leaving only a uniform, seamless EPDM roof. While it is not as flashy as many residential architectural roofing systems, it does convey an air of professionalism. “If it ain’t broke, don’t fix it” are words of wisdom that can apply to EPDM roofing as well. That’s because EPDM roofing has been around since the 1960s, and has proven its effectiveness over the years. 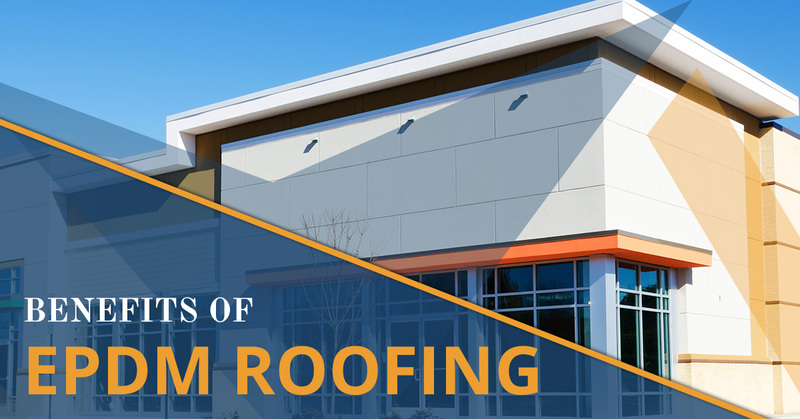 While there have certainly been improvements made to the EPDM roofing system, it is at its core one of the most cost effective commercial roofing systems, at least until a new one revolutionizes the game. Today, there is literally millions of square feet of EPDM roofing on commercial buildings across the nation. While we wouldn’t pretend that millions of people can’t be wrong, you only need to look around your local marketplace to see the efficacy of this roofing material in action. EPDM generally comes in two colors. There is the traditional black color, which is probably the most common. But there is also the reflective white. If you opt for the reflective white coating, you can save some serious cash on your heating bill, and do a little bit to help save the earth. That is because the reflective white coating reflects much of the suns energy off of a building, allowing your HVAC system to work just a little less hard, both decreasing its wear and tear and lowering energy costs. Of course, in Edmonton, business owners may want to take advantage of the fact that black EPDM material absorbs heat extremely well, and may significantly lower heating costs. EPDM roofing can stand up to many stresses that damage other roofing materials. Obviously, if your building is sitting in the sun all day, you want a material that is resistant to ultraviolet light. EPDM is. It is also resistant to both thermal shock and hail damage, making it great for Edmonton temperatures. Also, because it is made of a rubbery material, it does not deteriorate like certain other roofing materials. While EPDM does tend to give a business a professional air, for businesses that are going for a more flashy look, it may not be the correct choice. Also, while EPDM does have great impact resistant for blunt objects, it can be easily punctured. Roofs located under large trees may want to consider the hazards of falling branches. While punctures in an EPDM roof can be easily repaired, if there is a leak before repairs are finished, it could cause damage to the structure of the building. Hopefully you feel a little more informed about this commercial roofing material. If you are looking for more information on EPDM roofing installation in Edmonton, Golden West Exteriors can help! We want all of our customers to be happy with their purchase, which is why we walk you through all of your options until you are satisfied with your choice. For more information, please do not hesitate to give us a call at your earliest convenience. We look forward to hearing from you!